Naugahyde portable post ropes in 4' and 8' lengths. 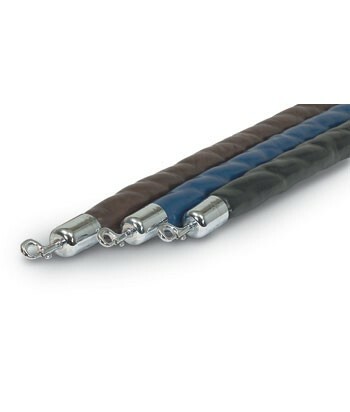 Available in 5 colors of tough, leather-like material with color choices to match any decor. Includes snap hook ends in either chrome or gold finish. With more than 30 years in the bank supply industry, we offer nearly every item on your supply list. Don't see what you want on our website yet? Give us a call. At U.S. Bank Supply you'll find only those items long experience has told us are the highest quality and best performers - no cheap knockoffs. With distribution centers located throughout the country, your orders ship quickly, often from a nearby warehouse. Order Today!